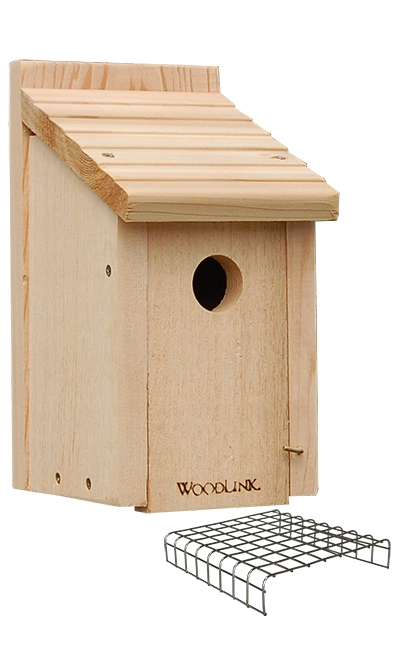 Provide melodious bluebirds a wonderful nesting spot with this Woodlink Deluxe Bluebird House. Bluebirds readily use manmade housing for their nests, often successfully producing two broods a year, and this fantastic shelter offers them a comfortable roost. Its durable, 0.75" thick cedar body brings a rustic and natural hint to your backyard, while the 1.5" diameter entry allows bluebirds to access the unit. The lapped roof overhangs this entrance, keeping rain away from the nest. Further protect the entry by adding the included Erva Steel Hole Protector around it, effectively deterring larger birds or other animals from enlarging it. The cedar construction helps the home remain nicely insulated, and ventilation gaps in the top corners keep it at just the right temperature for nestlings. Place the included Songbird Essentials Bluebird Nest Lift and Blowfly Screen in the bottom of the home prior to occupancy, so bluebirds can create an elevated nest. This prevents parasites from overtaking the nest and harming nestlings. Monitor the progress of the nest by lifting the home's front panel upward, and keep it securely closed with its metal latch. The flat base of the shelter may be attached to a pole or post using a mounting bracket (not included), or its flat back may be attached to a fence post or wall with the included screws. Help bluebirds locate a lasting and wonderfully nesting site by placing this Deluxe Bluebird House in your yard. House and hole protector made in the USA.